This construction management agreement is designed for an owner who is hiring a professional construction manager to supervise the development of a large manufacturing plant on its behalf. The agreement contemplates a guaranteed maximum price (GMP) for the project. The construction manager is obligated to work with the project architect who will produce the plans and specifications for the project (to be attached as an exhibit to this agreement). 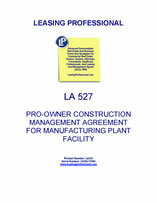 Likewise, the construction manager must cooperate with the lender financing the construction of the plant. The agreement covers the scope of work, reimbursable and non-reimbursable costs, work schedule and early occupancy, phased construction, applications for payment, default, trade contractors, insurance requirements, and change orders, as well as numerous other issues relating to the construction. The construction management fee is stipulated as a percentage of the guaranteed maximum price for the project subject to a maximum fee amount. THIS AGREEMENT, made as of the ___ day of ________, 20__, by and between Owner Corporation, as Owner, having its principal place of business at __________________ (“Owner”), and Construction Management Company, having an office at _______________ (“Construction Manager”). NOW, THEREFORE, in consideration of the mutual covenants and agreements contained herein, Construction Manager and Owner hereby agree as follows. (g) Construction Manager’s Qualifications & Assumptions (including allowances and trade contract qualifications and assumptions), attached hereto as Exhibit “F”. 1.02 The Contract Documents form the contract between Owner and Construction Manager. References in the Contract Documents to “the contract” or “this contract” shall be deemed to include all of the Contract Documents. References to “this Agreement” or “the Agreement” shall refer to this instrument, which is one of the Contract Documents. 1.03 The intent of the Contract Documents is to include in the Work all labor, materials and supplies, insurance, tools, equipment, permits (excluding building and site work permits which shall be paid for by Owner), licenses, taxes, approvals, transportation, testing and field surveying (customarily furnished by general contractors) and other services and items required in connection with the satisfactory performance, execution and Final Completion of the Work in accordance with the Contract Documents. Matters not expressly included in the Contract Documents but which are reasonably inferable therefrom shall be deemed included as a part of the Work. Controlled inspections, as required by any governmental authority, shall be provided by the Owner. 1.04 The Contract Documents are complementary and cumulative and what is called for by one shall be as binding as if called for by all. 1.05 Words and abbreviations which have well known technical or trade meanings are used in the Contract Documents in accordance with such recognized meanings. 1.06 If any conflicts or ambiguities exist in or between the Construction Documents, the Construction Documents and any of the Contract Documents, or the Construction Documents and existing conditions at the Project site, Construction Manager shall, immediately upon discovery of such conflict or ambiguity, bring the same to the attention of Owner for resolution. It is expressly understood and agreed that Owner, in consultation with Architect, shall be the interpreter of the Construction Documents and shall resolve any such conflicts and ambiguities. Any Work relating to any such conflict or ambiguity which is performed by Construction Manager’s own personnel or any Trade Contractor after discovery by Construction Manager but before Owner has had a reasonable time to respond to or address such condition, as provided herein, shall be at Construction Manager’s or such Trade Contractor’s sole risk, cost and expense. 1.07 Modifications to parts of the Contract Documents are for the purpose of varying, modifying, rescinding or adding to the Contract Documents. All modifications should be read together with the portions of the Contract Documents to which they relate. 1.08 The drawings and specifications comprising the Construction Documents are complementary. Anything shown in any of the drawings and not mentioned in the specifications, or mentioned in any of the specifications and not shown in the drawings, shall have the same effect as if shown or mentioned in both. 1.09 A typical or representative detail indicated on the Construction Documents shall constitute the standard for workmanship and materials throughout corresponding parts of the Work, unless otherwise shown. 1.10 The layout of mechanical and electrical systems, equipment, fixtures, piping, ductwork, conduits, specialty items and accessories indicated on the Construction Documents is diagrammatic. The actual scope of the Work shall be carried out so as not to affect the architectural and structural integrity and limitations of the Project and shall be performed in such sequence and manner so as to avoid conflicts and provide clear access to all control points, including valves, strainers, control devices and specialty items of every nature related to such systems and equipment in conformance with all applicable codes; it being agreed Construction Manager shall not be liable or responsible for errors, omissions, or coordination deficiencies in, between or among the Construction Documents. Subject to the provisions of Section 29.01 hereof, if Construction Manager discovers or has knowledge of (i) conflicts in or the shop drawings, the coordination drawings or the Construction Documents, or (ii) any conflicts between existing conditions at the Site (which Construction Manager is aware of or by testing as agreed to by Owner) and the Construction Documents which, in Construction Manager’s opinion, are of a nature that may affect the architectural or structural integrity or limitations of the Project, Construction Manager immediately shall bring the same to the attention of Owner and Architect for resolution in the manner provided in Section 1.06 hereof. Any Work relating to any such conflict which is performed by Construction Manager or by any Trade Contractor after discovery but prior to the resolution of the same shall be borne by the responsible party in accordance with Section 1.06. 2.01 Construction Manager shall perform all construction management services described in this Agreement in connection with the construction of the Work. The general scope of the Work, as initially reflected in the Construction Documents and as set forth in Exhibit “A,” will be developed into a detailed design and construction program and further refined as the preparation of the Construction Documents progresses so as to include, and further define, (i) the scope, parameters and anticipated timing for the Work, and (ii) Owner’s and Construction Manager’s understanding of the quality of the materials and workmanship required and expected. Construction Manager represents that (i) it has fully acquainted itself with the general design concept and scope of the Work, as reflected in the Construction Documents, (ii) it has visited the Project site and existing buildings, if any, including the location of adjacent structures and utilities, and is generally familiar with access to the Project site and with the observable condition of any existing buildings. Owner shall be responsible for obtaining all consents, licenses and easements required from adjoining property owners. 2.02 In addition to the services referred to in Section 2.01 hereof, Construction Manager, shall perform and furnish, or cause to be performed and furnished all labor, materials, plant, power, light, heat, water, telephone, tools, supplies, equipment, services, transportation, security and watchman services, scaffolding, permits, (excluding building and site permits which shall be paid for by Owner) licenses, supervision and shall perform or cause to be performed all of the general conditions work items set forth in Section 3.10 and described more fully in the Contract Documents (“General Conditions Work Items”) and shall provide all services, business administration, management, coordination and supervision, necessary for, or incidental to, the successful prosecution and Final Completion of the Work in the most expeditious and economical manner, consistent with best industry accepted standards, strict and complete compliance with codes and ordinances having jurisdiction over the Work, lawful construction practices and the interests of Owner relating to quality, timely economical completion of the Work, to the extent made known to the Construction Manager. The Work shall be performed and executed in a customary and workmanlike manner by qualified and efficient workers, in conformance with the Contract Documents and best industry trade practices. 2.03 Construction Manager agrees to furnish efficient business administration with emphasis on budget control, construction scheduling, coordination of the Work, supervision and construction management in an expeditious and economical manner consistent with the interests of Owner and shall assist Owner in developing and maintaining a climate of understanding and good will with all governmental and quasi-governmental agencies affected by the Project, the local communities adjacent to the Project site, and the public at large. Construction Manager shall require all Trade Contractors (as such term is defined in Section 8.01 hereof) to comply with Construction Manager’s instructions related to storage of materials and scheduling. Construction Manager shall generally advise and assist the Owner on all matters concerning the construction of the Project upon which the Owner requests advice and assistance and also about all matters concerning which Construction Manager, being familiar with the construction industry, might normally be consulted. All recommendations to be rendered by Construction Manager shall be in writing when requested, stating advantages and disadvantages and evaluating alternatives and shall be in sufficient detail to enable Owner to analyze such recommendations and make informed decisions with respect thereto. Without limiting the foregoing, Construction Manager’s obligations are more fully described herein.